BRYAN EATON/Staff Photo. 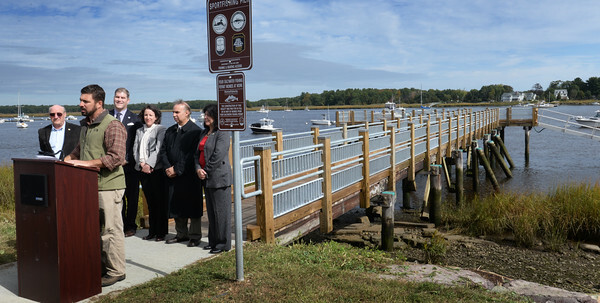 Matthew Beaton, secretary of the state Executive Office of Energy and Environmental Affairs speaks at the official opening of the new fishing pier and boat lauch at Cashman Park. Back, from, left, Department of Fish and Game Commissioner George Peterson, state Rep. Jim Kelcourse, state Sen. Kathleen O'Connor Ives, state Rep. Lenny Mirra and Newburyport Mayor Donna Holaday.